The key to a successful camping trip is having the right gear for a good night’s sleep. Waking up with a sore neck or back isn’t going to do you any favors and can quickly put a damper on the fun of camping. Good sleeping and shelter is key but don’t forget about a pillow. Camping pillows have come a long ways from the hard, uncomfortable models seemingly made from a tarp. Now they are as comfortable as your pillow at home and far more lightweight to boot. Here are 3 pillows that will keep you cozy and comfy at camp. All pillows are available four color options: poppy, indigo dot, denim and mosaic. The Medium size comes in those colors as well as blue floral and furry camo. These compressible pillows may not be the fanciest but they are some of the most comfortable. At first glance it would look like these pillows would be lumpy and hard but don’t be fooled. The bits of foam filling are soft enough to mold to your head but retain enough density that you feel supported. These are great pillows for back and side sleepers. Stomach sleepers may find that these pillows a bit too thick, depending on their personal preferences. One downside to the Therm-a-Rest compressible pillows is the weight and size of them. While 9 or so ounces for one pillow is reasonable for car camping, road trips and airlines travel, it is just a bit too heavy for multi-day backpacking adventures. For a compressible pillow it is actually light in weight but it still is fairly heavy compared to a comparable size inflatable pillow. It compresses down very, very well but still remains a bit bulky, which can be a hassle for long backpacking trips where every inch of space counts. 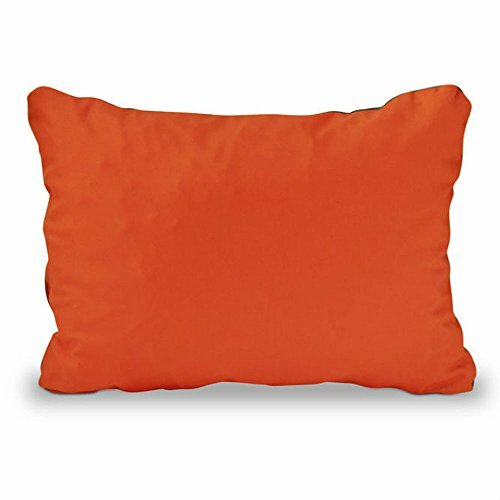 Overall the Therm-a-Rest compressible pillow line is super comfortable, durable and versatile. It’s only disadvantage really isn’t a big deal for those who stick with car camping or only go on short camping trips. Being priced at under $20 (check this listing for the latest live prices) is even more reason to add one of these pillows to your cache of gear. As a hybrid pillow with the benefits of a compressible and an inflatable in one, it’s no surprise that the NEMO Fillo is so popular amongst campers. 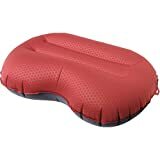 It has the density and small size typical of inflatable pillows but the comfort of a compressible. The design of the Fillo is quite impressive. The bottom of the pillow has a baffled inflatable sack like what would be on an inflatable pillow. The layer on top is a lush memory foam which is kept in place with mesh. The entire pillow has an outer shell of polyester microsuede. Naturally is has it’s own built-in stuff sack for packing. Comfort-wise, the Fillo isn’t quite as cozy as a traditional compressible pillow (like the Therm-a-Rest) but is far more comfortable than many inflatable pillows. The memory foam cradles the head and neck nicely while the inflatable bottom allows you to control how thick you want your pillow to be. Overall it seems to be comfortable for back and side sleepers as well as stomach sleepers, if you keep the pillow slightly deflated to whatever is comfortable. NEMO did keep campers in mind with the Fillo. It is a durable pillow and will withstand many seasons of use. The outer polyester cover is removeable so you can wash it easily at home- it is washer and dryer safe. Another neat feature is the size of the pillow. It fits perfectly into the hood of typical mummy-style sleeping bags snug enough that it will stay in place. If you’ve ever experienced waking up with a sore neck because your pillow slid off to the side of your bag in the night, you’ll really like this design. Overall the NEMO Fillo is a great choice for campers that also want something that packs down to a size that will work for backpacking as well. If you can’t decide between the advantages of a compressible vs an inflatable, go with a Fillo pillow and get the best of both worlds. The Exped Air Pillow is super lightweight and packs down to a very small size. It is great for camping and is small enough that you can also take it with you backpacking. Unlike so many cheap inflatable pillows on the market, the Air is ridiculously comfortable. The design of it is perfect for back and side sleepers. Side sleepers in particular will really like the contoured shape of this pillow which allows your shoulder to fit right into it, preventing any gaps between your head/neck and the pillow. The polyester tricot fabric is very soft and smooth against the skin. 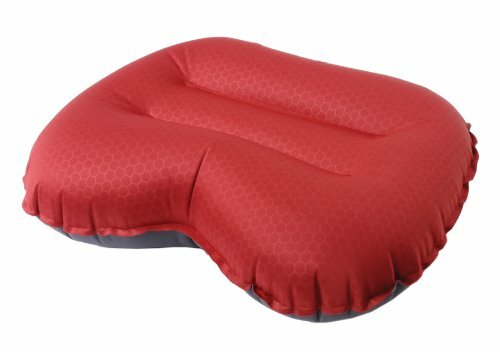 If you’ve used inflatable pillows in the past that feels like plastic or otherwise felt sticky or scratchy against your face you will really appreciate how silky this pillow feels. It definitely beats using a balled up jacket as a pillow for those campers that like to keep their gear lightweight. As far as inflatable camping pillows go, the Exped Air is quite impressive. While there are some more popular products on the market, few consistently have such high praises as this one. If you have about $40 to $50 (check this listing for the latest live prices) to spend on a lightweight pillow that is so small you could pack it in a large pocket, the Air will probably be the best choice. There really is no reason to go without a pillow while camping or resort to packing around bulky pillows from home. If you are someone that often ventures overnight into the great outdoors, buying a pillow specifically designed for camping is a lifesaver. Leave your luxury bed pillows at home and get one of these three instead.